After they released their first quad core tablet called Cherry Mobile Fusion Bolt, Cherry Mobile did a surprise launched of their first Quad Core Android phone yesterday together with the new Cherry Mobile Omega HD. 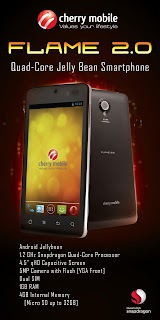 Cherry Mobile Flame 2.0 is the first quad-core Android phone from Cherry Mobile loaded with Android Jellybean OS and 1 GB RAM. No specific date of release but they posted that it will be available this coming April. 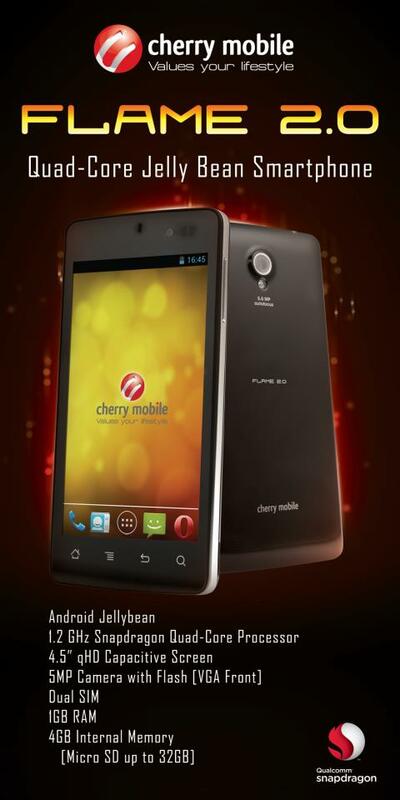 Still above are not yet complete, Cherry Mobile has not posted yet the official specs of Cherry Mobile Flame 2.0. Will update this post as soon as I got the details. Feel free to drop some comments if you know more about this device.